There are 4 area codes actively in use in metropolitan Miami: 305, 786, 754, 954. Metropolitan Miami includes Ft. Lauderdale, Miami Beach, Hollywood, Hialeah, and Pompano Beach, among other locales. Another handful of area codes is in use across other parts of the state of Florida. In Miami / Ft. Lauderdale, area codes are always included in written telephone numbers and area codes must be dialed for all calls, even for local calling. All US phone numbers are 10-digits total, including a 3-digit area code and a 7-digit local subscriber number. In the past, a given region often had just one area code. Nowadays, many cities and towns in denser urban areas, including Miami, have 2 or more area codes. To make an inbound international call (or domestic long distance call) to a Miami landline or mobile phone, you need to dial the appropriate 3-digit area code, followed by a 7-digit local subscriber number. There are currently 4 area codes used in the Miami metropolitan. Several of these area codes are relatively recent 'overlay' area codes that were added to provide additional phone number capacity. To accommodate demand for new phone numbers, Miami has added 'overlay' area codes - meaning that as new phone numbers are needed, a new area code is added within the footprint of an existing area code(s). For instance, the area code 786 was added several years ago within the footprint of the 305 area code. Here are the area codes for the 25 largest cities and towns in Florida (in alpha order). 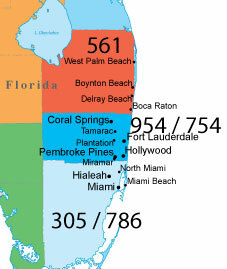 The following maps show area codes for Miami and the state of Florida. In some cases, area codes may be referred to as city codes. However, a 'city code' more correctly refers to the codes used to designate airports and other geographic locations. These codes are issued under the United Nation's UN/LOCODE system and/or the IATA airport coding system. The city code for Miami is MIA.